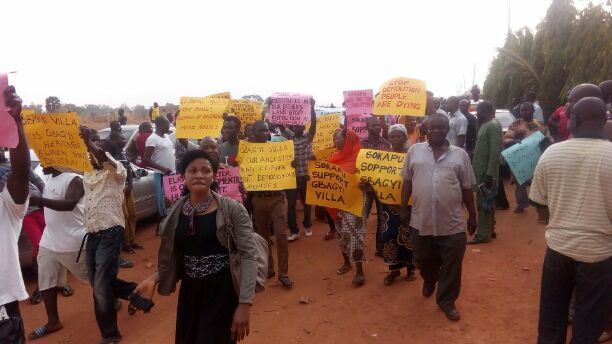 About 3,000 residents of Gbagyi settlement, the immediate host community of Kaduna Polytechnic, Chikun local area of Kaduna metropolis, yesterday protested the State government’s plan to demolish over 2,000 houses in the area. The State government had through its agency, Kaduna State Urban and Property Development Agency ( KAPSUDA), marked various structures in the area to be demolished within 21 days for not obtaining building permit from the agency before erecting the houses. The 21 days ultimatum is expected to come to an end next week. Recall, just last week, the bill to support master plan of Kaduna state had just been passed into law by the state assembly. Expressing further anger over the planned demolition, Chairman of the Gbagyi community, Chris Obodumu, told journalists at a press conference shortly before they embarked on peaceful protest, that contrary to KAPSUDA’s claim, houses were built after obtaining the permit. He noted that Gbagyi Villa has more than 3000 houses, adding that the area is a mini Nigeria where all ethnic and religious groups are represented. He said as law abiding, peace – seeking and responsible citizens, the affected residents are ready to dialogue with the State Governor, Malam Nasir El-Rufai over the matter. “The residents of Gbagyi Villa are calling on his excellency, Mallam Nasir El-Rufai to please come and talk to us. “We are calling on the governor to visit our community, come and inspect the physical facts on the ground. “By the time you visit us, we believe that you will agree with us that Gbagyi Villa deserves protection, not destruction. “We are also appealing to President Muhammadu Buhari to impress it on the government of Kaduna State the need for a change of heart. “We call on all advocates of justice, peace, fairness and human rights to join us in our quest for the preservation of our community”. Obodumu said. Meanwhile, Governor El-Rufai’s media spokesman, Samuel Aruwan yesterday went on State radio, appealing to Kaduna people not to join the protest to cause security breach in the State. Aruwan added that government was only recovering land illegally acquired by some people in the affected area, noting that it was not witch hunting as people alleged.